JOG: Touch sensitive platter for scratching, bending, and seeking through the song. FX1: Press this button to activate momentarily the selected effect of slot 1. Hold SHIFT and then press this button to select the next available Effect from the list for Effect slot 1. SAMPLER MODE. Use this button to toggle between the Sampler and the HotCue mode for the HotCue/Sampler buttons (25). 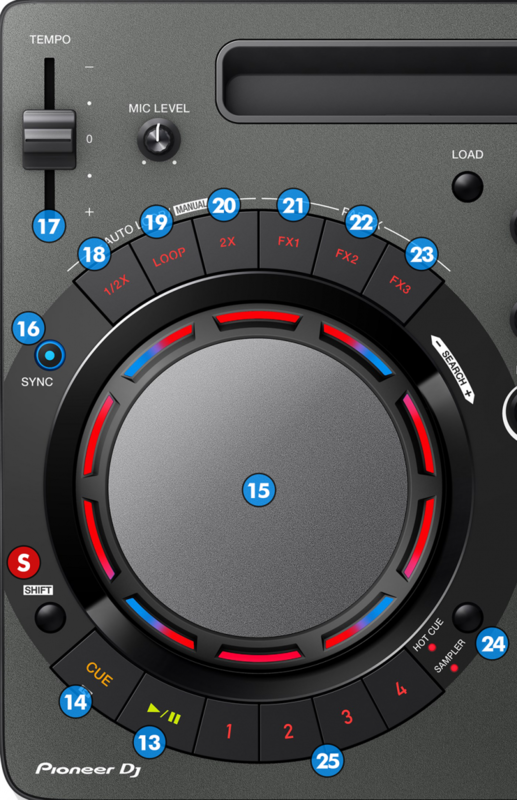 In Sampler mode, each one of the 4 buttons triggers a Sample from the selected Sampler Bank of VirtualDJ. If the selected bank has less than 5 samples, both sides of the DDJ-WeGO4 will control the same samples. If the selected Sampler bank has more than 4 samples, the left side of the DDJ-WeGO4 will control samples 1 to 4 and the right side will control samples 5 to 8.